An ancient Inuit golden mask...that's actually from Bronze Age Greece? 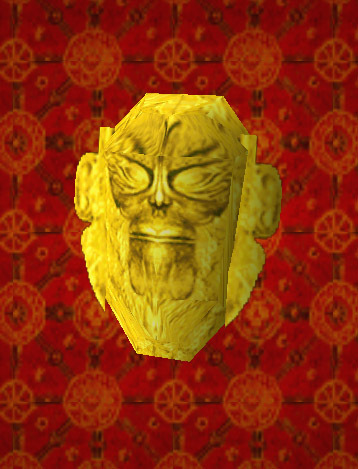 In this edition of Arte-Factual, we turn our attention to the Golden Mask of Tornarsuk, an artefact that makes an appearance in Tomb Raider II: The Golden Mask, a five-level mini-adventure that was created for the 1999 “Gold” edition re-release of Tomb Raider II. According to Inuit mythology, Tornarsuk (also known as Torngarsuk) is a god, or supernatural being, who is usually depicted in either polar bear or human form and is the leader of the tornat (or tuurngait), nature spirits that could be invoked in times of need or sickness through the use of amulets or shamanistic rituals. Tornarsuk and his companions were thought to be invisible to all but the Angakkuq, the male and female shamans who were the spiritual leaders of various Inuit communities found across Alaska, Canada and Greenland. The Angakkuq served as mediators between the human and spirit worlds and would often wear elaborate masks depicting animals or anthropomorphic figures as part of their rituals. If someone was sick or dying, the local shaman would invoke Tornarsuk and the tornat and persuade these sometimes benevolent, sometimes malevolent spirits to grant the shaman the power to heal the sick. According to the plot of TRII: The Golden Mask, the Mask of Tornarsuk not only had the power to heal but it could also bring the dead back to life. While no such mask exists, the use of masks in ritual ceremonies and storytelling was commonplace amongst the Inuit. Inuit masks were normally made of wood, bones or animal skin and were decorated with shells, feathers and/or paints made from berries and other natural dyes. However, since gold was not valued by the indigenous peoples of Alaska or the Yukon territory in neighbouring Canada, it is unlikely that this precious metal would have been used in Inuit mask making. This may be due to the difficulty in extracting and smelting gold and the fact that metallurgy in the northern parts of Canada and the United States was primarily for utilitarian purposes. On closer inspection, the Mask of Tornarsuk appears to be modelled on a real golden mask, albeit one that was created and discovered on a completely different continent. 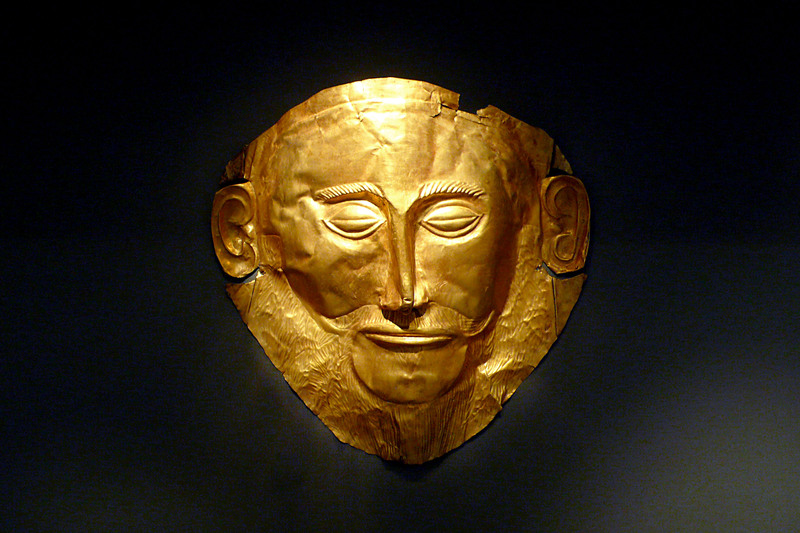 The mask in question is the so-called Mask of Agamemnon, a golden Mycenaean funerary mask that was discovered at the Mycenae archaeological site, Greece, in 1876 by Heinrich Schliemann. Schliemann, a German businessman turned archaeologist, was a controversial figure who spent most of his career searching for Troy and other sites that could prove the historicity of Homer’s Iliad. He believed that the citadel at Mycenae was the former palace of the legendary King Agamemnon, ruler or Argos and brother of Menelaus, whose wife Helen was abducted by Paris of Troy, thus sparking the decade-long Trojan War. The mask had been discovered in a burial shaft tomb in the burial complex Grave Circle A, a royal cemetery that lies to the south of the citadel. Schliemann was convinced that the body in Grave V was that of the legendary king, declaring that he had “gazed upon the face of Agamemnon”. Unfortunately for Schliemann, many of his theories concerning the age and history of the site have since been disproved and archaeologists now believe that the mask and tombs pre-date Agamemnon by three or four hundred years. Furthermore, there have even been suggestions that Schliemann had purposefully planted the mask in the tomb in order to support his claim that the tomb was that of Agamemnon. Whatever the case may be, one thing is for certain. The mask has captured the attention and imagination of countless tourists, historians and archaeologists….and, yes, even the occasional game designer.